Read carefully the following news release about the viewership of the Michael Jackson public memorial service. The numbers are what they are. WHO CARES that only 31 million people watch the broadcast on television and it was less than the audience for the Princess Diana funeral and President Obama's inauguration. A not so subtle attempt to minimize the importance of Michael Jackson. (Well... maybe MJ is getting too much media coverage he couldn't even beat out Princess Di ) The vultures of the media will do what they do. 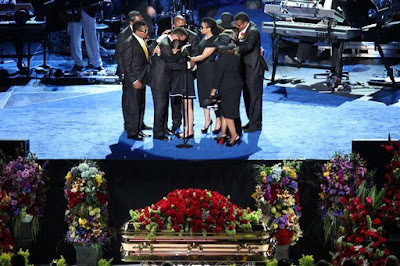 NEW YORK (AP) — Just over 31 million people in the United States watched the Michael Jackson memorial on television. Nielsen Media Research says that's a smaller audience than for Princess Diana's funeral or President Barack Obama's inauguration — but it's still impressive in today's TV world. Millions more watched video streams on their computers. The Jackson memorial on Tuesday afternoon was carried live on some 18 different networks, including all the big broadcasters and cable news stations. By comparison, President Obama's inauguration in January had an audience of nearly 38 million. Nielsen says 33.2 million people in the U.S. watched Princess Diana's funeral in 1997.